Tile specialist, Topps Tiles Plc, has announced a trading update for the 26 week period ending 30 March 2019. Total revenues for the 26 week period were £108.8 million, compared to last year in 2018 where it was at £109.4 million. Like-for-like revenues for the 26 week period increased by 0.2%. Trading over the second quarter has improved from the levels reported in Q1, with like-for-like sales increasing by 1.8%. The company has said it estimates that the effect of weather conditions in the prior year and a later Easter this year has benefitted like-for-like sales over the quarter by around 1.6%. Topps said it believes that the continued execution of its strategy is enabling us to outperform the overall tile market. The Group's "Leading Product" strategy of differentiation and innovation at pace is "more relevant and important today to our customers than it has ever been and is our key competitive advantage," said Topps, with the company launching 20 ranges so far this year, including a new porcelain tile range developed specifically for outdoor use. The company said: "We are making good progress in leveraging our buying scale and advantage into commercial with over 70% of Parkside sales sourced through 'preferred' Group suppliers in the first half of the year." The company has said its strategy of "Out Specialising The Specialists" is enabling it to continue to grow ahead of the UK tile market. It said: "We are rolling out our latest merchandising initiatives across the estate and completed 39 mini refits during the period, bringing the total number of completed stores to 180. We also launched "Tile Talk", a new customer feedback system, during H1, which resulted in an overall satisfaction score of 86%, placing us in the top five retailers in the UK." 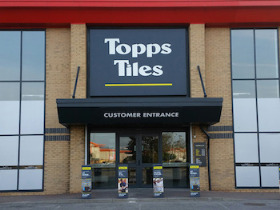 Topps Tiles ended the period with 361 stores trading and a further four in fit out, having opened six and closed 13 stores during the first half. "The flexibility of our store estate, with an average unexpired lease term of four years, remains a key strength that we will continue to leverage to ensure our portfolio remains closely attuned to customers' needs," Topps said. s to outperform the overall tile market. Our commercial business is growing at pace and we remain open to opportunities to accelerate its expansion." The Board has said it will announce interim results for the period on 21 May 2019.